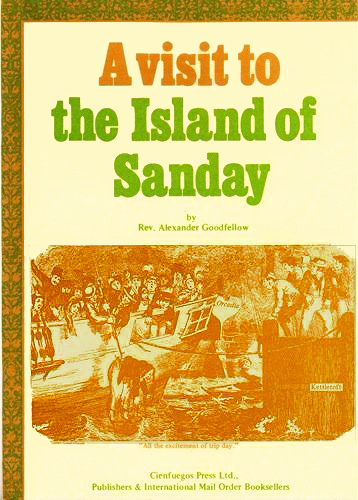 A VISIT TO THE ISLAND OF SANDAY by the Revd. Alexander Goodfellow. First published 1912 by W. R. Mackintosh, Kirkwall. Second edition published 1978 by Cienfuegos Press,, Over-the-Water, Sanday, Orkney, KW17 2BL. ISBN 978-0-904564-10-5. This eBook edition published 2013 by ChristieBooks. Being a new edition of the introduction to Goodfellow’s Church History of Sanday, with some light-hearted illustrations* that have no justification other than serving to stimulate the imagination as to how it might have been. The text is prefaced with a rather tortuous introduction by the publisher, Stuart Christie, relating to current political problems facing Scotland in general, and Orkney and Shetland in particular.